The Sunshine State is a blazing 28C in August, but the superb weather isn’t all it has to offer. World-class entertainment, hair-raising rollercoasters, subtropical beaches, exotic wildlife, fabulous food and shopping… it really is a feast for the senses. And you needn’t pay a fortune for a summer getaway. Experience the holiday of a lifetime at a fantastic price with our cheap August Florida holiday. Fly to Orlando, grab the keys to your fully-insured SUV and take a quick drive to the Homewood Suites Universal Orlando. 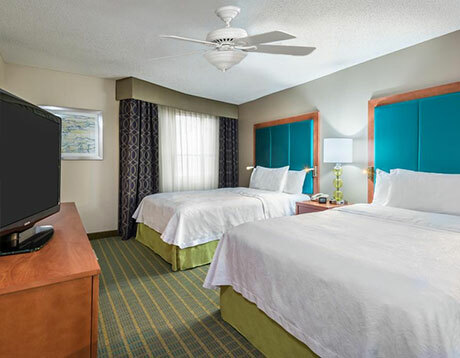 Enjoy two weeks in this popular hotel, right in the middle of International Drive’s entertainment district. All from just £975 per person. If this doesn’t appeal, we can put together a tailored Florida package to suit you. We have years of experience booking cheap summer Orlando holidays. Orlando flights are typically the biggest expense of any Florida vacation. Achieving good value here is critical for your cheap August Orlando holiday. Can you leave in the last week of August? The shoulder season begins towards the end of the month – leaving late August and returning in September saves a substantial amount of money. Planning to leave in the 3rd week of August? Flight prices are better value than early August, even on direct routes. Avoid the weekends – mid-week departures (especially Tuesdays and Wednesdays) are much better value. Indirect flights are the most economical on peak dates. One change en route adds a couple of hours to the journey but provides a saving. Heathrow has the most departures. A cheap August Florida holiday is possible on peak dates if you depart from Heathrow mid‑week. Glasgow, Edinburgh and Manchester also offer excellent fares if you’re prepared to fly indirect. We can typically offer a very good fare to Orlando International. Occasionally, Tampa Airport is more cost-effective. The drive to your accommodation takes a little longer, but the savings might be worthwhile. What are you expecting to pay for your August Florida flights? Prices of over £1000 are typical. If you book early and follow our suggestions, you could achieve prices as little as £700 per adult and £525 per child, even on peak dates. Book your cheap August Florida flights with a deposit of £100 per person. Full ATOL and ABTA protection. We don’t compromise on quality when it comes to Orlando flights. We book with the major airlines; BA, Virgin and United are popular choices. We achieve cheap August Florida holidays by constantly monitoring fares and booking seats at the best possible price. Patience and experience are the key. Orlando flights are released 11 months before departure, but we don’t always book them immediately. We check prices daily and book your seats as soon as we’re confident the best fare is available. You don’t need to penny-pinch when it comes to car hire – Florida vehicle hire is very cost-effective. Alamo, Avis, Budget, Dollar and Hertz all compete to offer the best value. We shop around and book when one of the suppliers is having a sale. Why not treat yourself to an SUV or a convertible on your cheap August Florida holiday? We don't try to economise on vehicle-hire insurance. We book the full package of insurance as standard. Multiple drivers can be added to the package for a small fee. This cheap Orlando holiday includes a fully-insured standard SUV – ideal for a family of five. If your party has different requirements, we can suggest the best option. We can achieve a cheap August Orlando holiday without compromising on accommodation. We only book with reputable hotels and resorts. We achieve value by monitoring prices and booking your accommodation at the best moment. The sooner you book, the more time we have to find a hotel room at an excellent price. 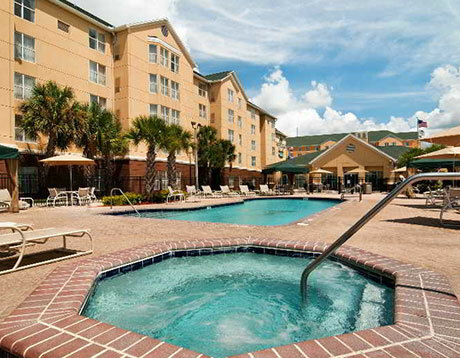 Our cheap August Florida holiday includes a room at Homewood Suites Universal Orlando. 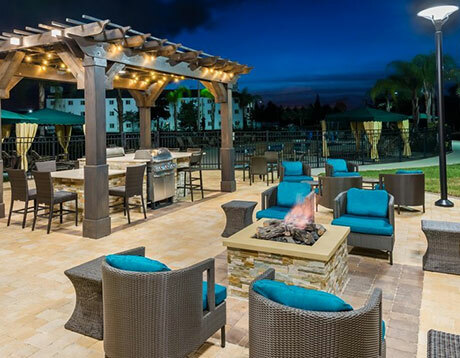 This popular hotel has the usual amenities including Wi-Fi, outdoor pool, air conditioning and free parking. A buffet breakfast, included in the price, is served every morning in the dining room. 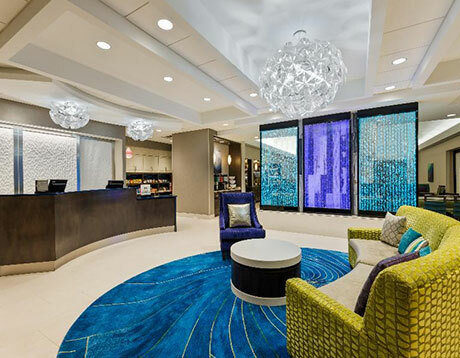 The location is perfect – right in the middle of International Drive’s entertainment district. Florida’s top theme parks and attractions are only a short drive away. 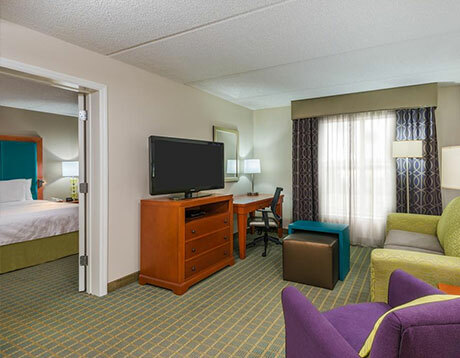 Read the Homewood Suites reviews on TripAdvisor – over 1700 reviews average out at 4.5 stars. We’re already booking summer 2019 and 2020 Florida holidays so get in touch today if you’d like a cheap Florida holiday in August. No Florida holiday is complete without experiencing the wonder of Disney World and Universal Studios. Don’t pay over the odds – buy your attraction tickets in the UK before departure. Disney’s 14 Day Ultimate Ticket and Universal’s 3-Park Explorer Ticket are the most popular options. We can beat any price you find online. Tickets can be added to your booking with no additional deposit. Advance bookers have the best chance of achieving a cheap Orlando holiday in August. The sooner you book, the more time we have to secure good value flights and accommodation. Book today with a deposit of just £100 per person. The balance is due 90 days before departure, giving you plenty of time to save. This cheap August Orlando holiday is available from £975 per person. It includes Florida flights, two weeks at Homewood Suites Universal and a fully-insured SUV. If you have different requirements, let us know. Complete our online enquiry form for the best value package holiday to Florida. Or call us on 01934 319 851 and speak to one of our friendly Florida experts. All of our cheap August Florida holidays are ABTA and ATOL protected. Holidaymakers on a budget might be interested in our cheap July Florida holiday. Fly to Orlando, stay for a fortnight in a Hampton Lakes villa, drive a fully-insured vehicle – all from just £975 per person. Book early for the first choice of accommodation on peak July dates.